We are taking our 6 month old puppy to the snow for his first time this weekend. We tried on booties at the local pet stores and they just wouldn't stay on. I just learned about Mushers secret, it sounds terrific, but I'm out of time to order online and can't find any retailers in my area. Is there any other creams or gels that work as protection against the cold and salt? 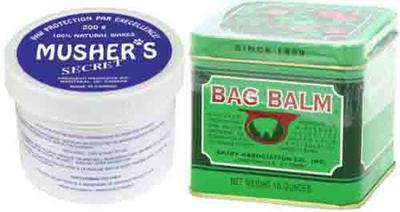 Vaseline or Bag Balm can be used to protect a dog’s feet from cold, snow and salt. I suspect they won’t last as long as the more “waxy” Musher’s Secret, but they are better than nothing and can mostly be wiped away with a warm, damp washcloth when it is time for the dog to come back inside. Join in and write your own page! It's easy to do. How? Simply click here to return to Paw.